VHD Pre module for 500 format racks. Uniquely versatile mic pre and processor delivers everything from ultra-clean to slightly warmed to heavily distorted recordings. The VHD Pre Module for the popular 500 format modular rack platform makes the uniquely versatile VHD based preamp technology from Duality, SSL's industry leading large format studio console, available for studios of all sizes. The VHD Pre is an immensely versatile recording and processing device. It can deliver ultra clean SSL SuperAnalogue. Grade recordings but also features a switchable VHD mode. SSL's patented Variable Harmonic Drive (VHD) system uses a 100% analogue signal path to generate rich harmonic distortion. As you increase VHD input gain, the Variable Harmonic Drive process introduces either 2nd or 3rd harmonic distortion or a blend of the two to your source material. At lower gain settings it adds gentle valve-style warmth or a touch of transistor edge. As the gain is increased the more extreme the distortion becomes until at high gain settings it delivers fierce trashy transistoresque grunge. 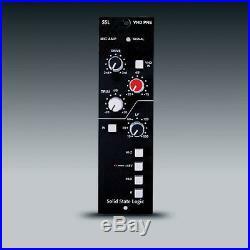 The VHD Pre gives the user ultimate versatility from a studio grade preamp. Whether it's ultra-clean traditional SSL, subtle warming or totally trashy transistor distortion, VHD will change your expectations of what a preamplifier should deliver. The VHD section of the VHD Pre Module has three rotary controls: a Drive control selects 2nd harmonic or 3rd harmonic distortion or a continuously variable blend of the two. A +20/+75dB gain control sets input level. A -20/+20dB trim control adjusts the output level from the circuit to enable level matching with other devices, because by its nature the VHD circuit can significantly increase signal levels. The VHD Pre Module has a selection of other essential professional preamp features: a signal present LED, a switchable 15Hz to 500Hz LF Filter section, Hi-Z impedance switch for mic impedance matching, +48V phantom power, PAD to enable the VHD system to be used as a line level processing device and a Phase Invert Switch. Uniquely versatile recording and processing. Ultra clean SSL SuperAnalogue grade preamp. Switchable VHD system adds controllable 2nd or 3rd harmonic distortion. Switchable LF Filter (15Hz to 500Hz). Hi-Z switch for high impedance microphone use. +48V Phantom Power with status LED. PAD for use with line level source material. We operate a full service commercial recording studio, and can help you determine the right product for your application. The item(s) must be in new working condition and show no signs of wear or use. Unsealed PCI, PCIe, and LSlot cards. Special Orders such as custom cable orders. Circleontinued, open box and clearance items. How to Return an Item. Pure Wave Audio is a boutique Pro Audio store that specializes in recording gear, from microphones to full studio installations. Search for us on the web; PureWaveAudio. Our website offer extensive information, product reviews and direct access to our staff. Don't forget to search for Pure Wave Audio on YouTube and Twitter and also "Like us" on Facebook. The item "Solid State Logic VHD Pre Module for 500-Series Racks" is in sale since Thursday, December 03, 2015. This item is in the category "Musical Instruments & Gear\Pro Audio Equipment\Preamps & Channel Strips". The seller is "purewaveaudio" and is located in Tucson, Arizona. This item can be shipped worldwide.